We have sorted them by location, price range, and cuisine type – from Best of Main Street Park City Restaurants to Best Breakfast, Resort Restaurants, Brew Pubs, Sushi, Coffee Houses, Best Cheap Restaurants and more. Most people expect restaurant prices at a resort town to be higher than your average city-rate and Park City is no exception. Park City is synonymous with high-end, budget-busting eateries. I’ve been on the ski lift with out-of-town visitors and many have made the remark of how expensive it is here to eat. With that said, there are plenty of restaurants here that are well-worth the price. But if you have access, read reviews on Yelp, Google, etc.. before choosing a restaurant. Just because a restaurant is in Park City and claims to be world-class, doesn’t mean it is. 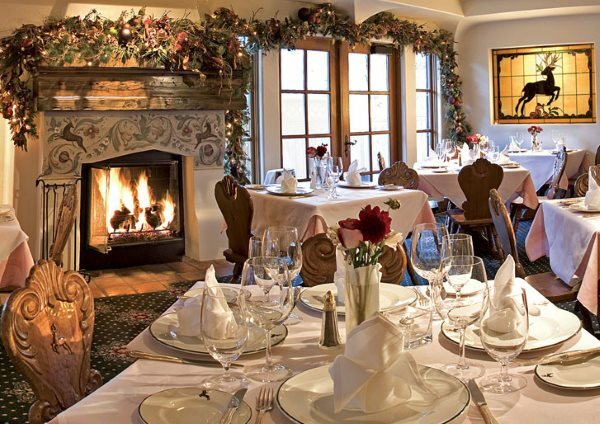 The Goldener Hirsch Inn Restaurant at the Deer Valley Resort is one of the best restaurants in Park City and certainly splurge-worthy. We’ve had some mediocre meals and service at some “fine-dining” establishments. But you don’t have to eat at McDonalds either. There are some awesome mid-priced and cheaper places that have excellent food. 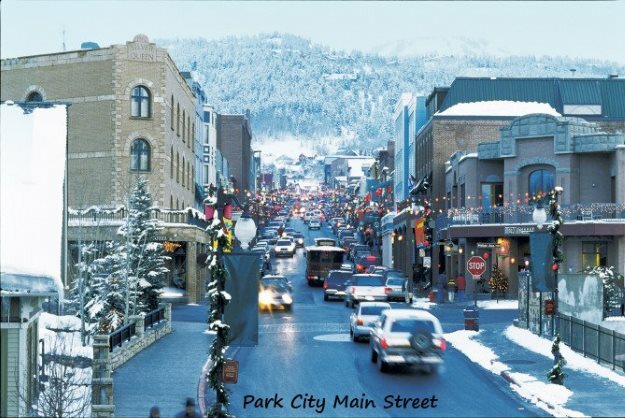 We will list here by category some of the best Park City restaurants that stand out with consistent, positive reviews. Tip: Know Before You Go – I’ve never seen restaurants come and go so quickly like they do in Park City. So before you go to any restaurant in Park City that you haven’t seen or physically been to yet, call ahead and make sure it still exists. We have learned that mistake about 4 times now. Either the restaurant had closed or moved to another location or changed its hours. So don’t rely on a listing you see in a brochure or magazine or even online. One way that is semi-reliable is if you see recent reviews for the restaurant within a week or two of the current date. Tip: Main Street Restaurants – Main Street Restaurants are usually very busy during the ski season, especially after 6pm. It is highly recommended to make reservations, especially at the more popular, higher-end restaurants. Tip: Restaurant Discounts – Be sure to stop by the visitor center on the way into Park City. There’s a coupon book you can pick up that includes discounts to restaurants. You may also find coupons in The Park Record (Park City local newspaper). Tip: BYOW – A bottle of wine can be expensive at Park City restaurants, more so than usual because of Utah Liquor Laws. To save some money or to have more choices, you can purchase wine at any of the Park City State Liquor Stores (listed in the liquor laws chapter) and bring the bottle to the restaurant.Utah calls this “Brown Bagging.” At the discretion of the restaurant or club, brown bagging is permitted at licensed establishments only. A corkage fee will be charged, and in most cases this will still be cheaper (corkage + cost of wine) than buying the bottle at the restaurant. However, for an upscale restaurant like the Riverhorse on Main, their corkage fee is $30 per bottle. Here I am listing the best expensive restaurants on Main Street because it is a popular location for visitors to eat and aside from resort-specific restaurants (which I list in a separate category later on), is where many of the best restaurants in Park City are located. Consistently rated above average for their food, service and atmosphere. “Best Restaurant in Park City” 2011-2013 by Salt Lake Magazine. Zagat Ratings (out of 30): Food: 28, Decor: 27, Service: 26. Another “Best of the Best” in Park City. Awards: First Utah restaurant to receive the DiRoNA Excellence in Dining Award, Mobil Travel Guide Four Star Award: Top 108 Restaurants in US, Canada and Mexico; Forbes Travel Guide Four Star Rating, AAA Four Diamond Rating. Zagat Ratings (out of 30): Food: 26, Decor: 25, Service: 26. Chimayo doesn’t have all the awards like the above two restaurants, but it consistently gets good reviews from diners for both its food and service. A few that say it is overpriced, but that’s a common criticism of most Park City restaurants. Zagat Ratings (out of 30): Food: 24, Decor: 24, Service: 23. Zoom is owned by Robert Redford. It has a casual, elegant setting in restored train depot. Winner of Best of State American Continental Cuisine 2010, Casual Dining/American 2007-2008. Rachael Ray went to Zoom on her show, “$40 A Day”. Zagat Ratings (out of 30): Food: 21, Decor: 23, Service: 21. Finding good “mid-priced” restaurants in Park City is kind of difficult. Located in Old Town Park City (one block west of Main Street), this world’s first and only ski-in gastro distillery celebrates the rich heritage of Old West saloons. So it’s a unique place to eat, especially if you’re into the Wild West kind of theme. It is comprised of 2 buildings listed on the National Register of Historic Places. This is more on the higher-priced end of mid-priced, but still not considered “expensive” for Park City. Vinto may be leaning towards the “cheap” price category, but I listed it here because although casual, it has a nicer atmosphere than most lower-priced restaurants. Labeled, “Best High-Class, Low-Price” by City Weekly Magazine. Specialty is wood-fired pizza, but also has some pasta offerings, antipasta and salads. Homemade gelato, sorbet and desserts. Won Best of State 2011-2013. Readers’ Choice Awards from Salt Lake Magazine: Best Restaurant Park City, Best Italian, Best Quick Eats, Best Lunch. Silver Star offers both lunch and dinner as well as a weekend brunch menu. It’s a rustic, cozy cafe that overlooks the mountains of the Park City Mtn. Resort in the distance and the closer Park City Golf course in summer and the cross-country ski track in winter. Most customers rave about the food and describe the place as a “hidden gem”. Again, “cheap” is relative to Park City Restaurant prices. 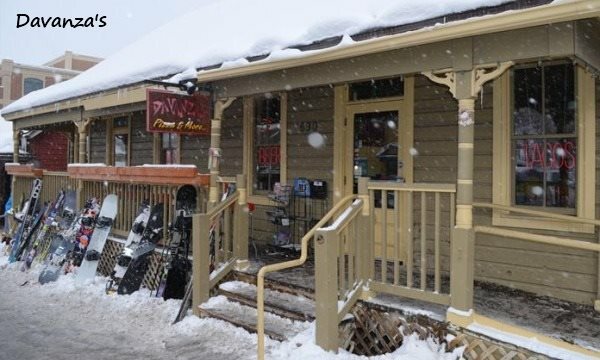 These are places you want to go for good food, fast service and perhaps something during lunch or a quick bite after the slopes or just a casual place to go, and is not McDonald’s. All the below listing are open for lunch and dinner. There are also cheap places just for lunch, but I am listing them separately since they are not open for dinner too. I am purposely leaving out all the usual chain food restaurants that I’m sure most of you know about. Besides McDonald’s, there is Taco Bell, Arby’s, Wendy’s, Burger King, Pizza Hut, Subway, etc.. if your heart desires. Where locals and visitors love to go for good, cheap Mexican food in Park City. Let me point out that you don’t come here for ambiance and a Mexican quartet singing table-side. The restaurant is located in a strip mall and you order from the counter, which makes it faster than sit-down waiter service. You don’t come here for the most authentic Mexican cuisine either. It’s the standard burritos, tacos, tamales with some house specialties like empanadas, chile rellenos and street tacos. A highlight for most is the salsa bar. Bottom line, most find the food tasty and in large portions which is especially good for those on a budget and don’t want to eat at Taco Bell. Rachael Ray (Food Network) raved about it on her visit. Nick’s was originally owned by a Greek family and when ownership was transferred, so were the Greek recipes. But the new owners added some of their own Vietnamese specialties like a pork Vietnamese sandwich, rice and noodle bowls, Italian beef sandwich and “Japadawgs” – smoked polish sausages. Normally, I would avoid such a mish-mash of cuisines at one restaurant (master of none), but I come here because the Greek food is as good as it was when Greek-owned. I typically get a Gyro ($5.95) and a side of sweet potato fries ($3.50 – I think the fries are a little expensive, but they’re good). Some come to Nick’s just for the Red Hot Chicago Dogs. It’s a relaxed cafe with friendly service, good food and is reasonably priced. Nick’s is sometimes hard to find. It is in the Snow Creek Shopping Center strip mall, across from the State Liquor Store, between the Market Grocery Store and Snow Creek Medical Center. Here is our Nick’s Greek Cafe Review. A local’s favorite, Davanza’s is often referred to as a “Dive” but people love the food and low prices, especially for a place that is located near Main Street. Besides pizza, they offer burgers, subs, street-tacos and salads. Price range: $6 – $22 (the most expensive item ($22) is a large 16″ pizza called the “Mucker Supreme” with assorted meats and veggies). Specials include 2 slices of pizza and a soda for $6.75. Burgers are around $6-$8. Tacos are $2.50 each. Davanza’s location downtown is just one block west of Main St. on Park Ave., not far from the Park City Mtn. Resort Town Lift. Many ski down off the mountain & park their skis and boards outside Davanza’s while they eat. Double listing of Vinto (Italian) from “mid-priced” category because it is “cheap” too! Specialty is wood-fired pizza, but also has some pasta offerings, antipasta and salads. Homemade gelato, sorbet and desserts. There are not a lot of places that specialize or do breakfast well in Park City. Sometimes your best bet is to eat breakfast at your hotel, if they offer one. But here are a couple that typically get good reviews for their breakfast fare. A favorite place for breakfast located on Main Street. Cozy atmosphere, reasonable prices, big portions. Omelettes, waffles, pancakes, house specialties: biscuits & gravy, huevos rancheros, eggs benedict, chicken fried steak & eggs, skillet egg combos and more. Apex is located inside the Montage Deer Valley Luxury Hotel. It offers a daily “Skiers Buffet” with traditional and gourmet breakfast items, featuring live-action stations. Kneaders offers homemade pastries (bread pudding, brownies, croissants, cheesecake, cannoli, muffin tops, etc.) french toast, pancakes, egg sandwiches for breakfast and also open for lunch (soup and sandwiches). Price range: $3-$5. Located in the Newpark shopping area at Kimball Jct. Counter service. Tripadvisor 2013 Certificate of Excellence. The Grub Steak Restaurant offers fresh home-ground burgers, sandwiches, paninis, tacos (all priced between $8-$11) which all come with choice of fries, coleslaw, mashed potatoes, a cup of soup or garden greens, plus you can add a trip to their salad bar for $3. They also offer ribs and steaks off their dinner menu if you desire (but is a little more expensive – $21-$40). Fun, Western-Cowboy decorated interior. Tripadvisor 2013 Certificate of Excellence. Serves hearty, homemade soups, salads and sandwiches at the top of Main Street in a cozy lil’ shop. Just note that during the Sundance Film Festival in January, the owner chooses to only serve locals (at least that’s what she did during the last 5 years). It gets really crowded during that week and she wants to make sure her regular local customers have a place to eat without the wait like everywhere else in town. Sandwich prices: Half: $5.00, Whole: $9.95. The Glitretind in the Stein Eriksen Lodge at Deer Valley was voted by locals as “Utah’s Best Sunday Brunch” and has been rated by the Zagat Survey as being the “Most Romantic Restaurant” and having the “Best Sunday Brunch” as well. Whether you go for Sunday brunch, breakfast, lunch or dinner, you will most likely, as others, be satisfied with all aspects of your meal. The food is superb as well as the service and the beautiful slopeside views. This is a place you go to splurge, not for a budget meal. The Glitretind is located inside the Stein Eriksen Lodge at 7700 Stein Way. Riverhorse is one of the best restaurants in Park City for dinner, but they also offer brunch from Thursday – Sunday, 10:30am to 1:30pm. Savor the stuffed French toast with orange cream-cheese filling and warm syrup or delight in duck confit eggs benedict with classic hollandaise and be sure to toast friends and family with a glass of champagne or your favorite glass of wine off the award-winning wine menu. Note: You may find some places online talking about the Talisker on Main Brunch, but I just contacted them and they told me they no longer offer brunch. Most any full service restaurant you eat at Deer Valley will be excellent as well as expensive. It’s where you come to splurge, not for a budget meal. There are many restaurants at Deer Valley, but here are a couple not to be missed. These are definitely worth going to even if you are not staying at Deer Valley Resort. Deer Valley’s Seafood Buffet is listed as one of “America’s Top Restaurants” in the Zagat Restaurant Guide. If you like seafood, then this one’s a no-brainer. It’s a little pricey at $64/adult, children 11 years and younger/$34 (price does not include beverages, tax or gratuity), but we feel its worth it. Besides, by the time you spend $20 on entrées at other pricey Park City Utah restaurants and then add on appetizers and desserts, you’re basically at the same price point. The Seafood Buffet offers a vast array of fresh seafood, including sushi, chilled shellfish, hot seafood appetizers and entrées, along with grilled fowl, pasta and prime rib, plus fabulous homemade desserts. After a long day on the slopes, you deserve it! Great ambiance, professional service and some of the best food you’ll ever have. AAA Four Diamond Rated, Salt Lake Magazine “Best Restaurant” in Park City, Rated #2 in Ski Hotel Restaurants in North America by Conde Nast Traveler, Tripadvisor 2013 Certificate of Excellence. Wiener Schnitzel, Rocky Mountain Elk Ribeye, Niman Ranch Pork Osso Bucco, Wild Prawns, open for breakfast, lunch and après-ski (winter only, of course) and dinner (summer & winter). Located mid-mountain in Silver Lake Village at Deer Valley. Voted 2012 “Best New Restaurant in Utah” by Salt Lake Magazine. Locally sourced ingredients within 200 miles of Park City. Entree price range: $18-$38. The Park City base, unlike Deer Valley & The Canyons Village, has a few casual restaurants but nothing really special. The only full-service restaurant at the resort is the Legends Bar & Grill and the next closest is the Baja Cantina which are both okay, but nothing special. I’m guessing that because Park City is so close to town and all the Main Street Restaurants, it decided not to focus or offer and upscale restaurant. “Best pizza” is relatively speaking here. Some people like thick-crust, some people like thin crust. Some people may prefer Pizza Hut (which Park City does have) over the pizzerias listed below. Park City is neither Chicago nor New York nor Napoli. But here are some places visitors and locals enjoy, the trend being authentic, wood-fired pizzas. Sit-down service in a modern-styled restaurant. Conveniently located on Main Street. Price range for personal pizzas: $10-$12. Wood-fired 12″ & 16″ pizzas. 16″ pizzas for some reason are served to go only. Price range for 12″ pizzas: $9-$13. Sit-down service. Around the corner from Park City Marriott in Prospector Square. Maxwell’s serves authentic New York style, thin-crust pizza. IT is ;ocated in Newpark shopping area at Kimball Jct. next to the Swaner Nature Preserve. It has an upbeat, sports-bar atmosphere with lots of HD flat-screen TVs. You can order pizza by the slice for $3 or get a whole 20″ pie – price range from $16 (cheese) to $21 for specialty pies or pay $2 for additional toppings. Maxwell offers bar seating and sit-down table service. Here is our Maxwell’s East Coast Eatery Review. Thin crust pizza. In 10″, 12″, 14″ and 16″ sizes. Cheese-only example price range from personal size to large: $7.75-$13.75. Counter service. This is the fast and cheap option for pizza. There are several brew pubs in town. Here are 2 of the most popular. Most say the beer is great. It’s hit or miss on the food. Weird Utah Alcohol Law Alert: You can only try 2 beer taster samples at a time. Standard pub fare rated anywhere from “nothing special” to “exceptional” including burgers, sandwiches, tacos, ribs, steak and ale battered fish and chips. Draft beer prices: glass $4, mug $5, growler $14, taster $2, pitcher $13, growler refill $10. Located at the top of Main Street. Again, some people love the food, some people say it’s terrible. But most say they really like the beer selection. Draft beer prices: 1/3 litre $3.99, 1/2 litre $4.99, pitcher $11.99, growler fill/refill $11.99/$7.99, sample 0.49. It’s located off the main drag (Park Ave.) into Park City, across from the Park City Golf Course. Won “Best of State” Japanese Cuisine 2010-13, Ski Magazine’s “Top 10 Ski Resort Sushi in America”. Hot and cold tapas price range: $10-$22, Nigiri/Sashimi price range (2pc): $8-$15, Maki: $8-$12, Special Maki-Sushi: $13-20. We went to Yuki for lunch and it was great. Our server was very nice and helpful when we asked questions and checked up on us just the right amount of times. The food was excellent and the atmosphere relaxing. Here is our Yuki Arashi Review. There are a handful of cafes in Park City. Here are 2 local favorites. Coffee, specialty drinks and over 70 varieties of loose leaf tea. Also serves breakfast and lunch (small menu, but quality ingredients). Browse thousands of used books or use the free WiFi while you relax in comfy chairs. Family owned and operated. This is more of a tourist spot and tends to get a lot of reviews, both good and bad. A popular spot on Main St. Some just come for the ice cream. This is a must-do if you want a unique dining experience that you’ll always remember. You start out the evening with a 23-minute sleigh ride up the slopes of the Park City Mtn. Resort to the warm and cozy, yet elegant Yurt where a 6-course gourmet meal awaits. 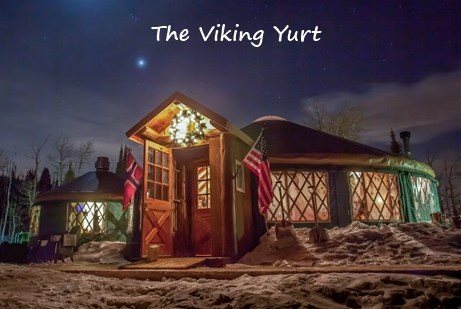 The Viking Yurt was featured on The Food Channel as their restaurant of choice for Utah in their “Rocky Mountain Christmas” Special. Yes, somewhat pricey, but you can’t do this at home. You’re on vacation, go ahead and splurge!